Greetings from Deimos: come for the view, leave because of the low escape velocity. We start talking about installing a cog as our ship AI, and then wander all over the solar system. And then we get to our topic. On the subject of technical difficulties! Last episode, Whines was a little muffled, his mike was the weakest of the group. This time we had a wireless for a replacement, but it was just a bit too big for the stand! 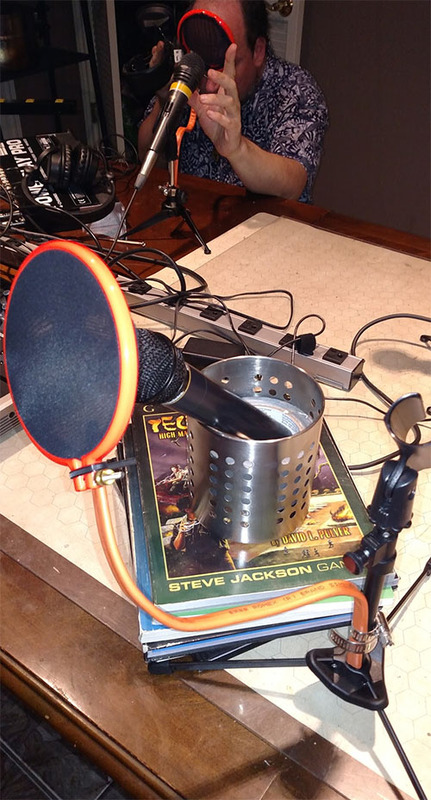 Here’s the makeshift mike stand…pop-filter, stainless steel can, and four inches of GURPS books. Finally, Corbeau gets to use his GURPS books. ♃ 01.03—let’s meet the hosts! ♃ 03:34—Another look at at the HSD miniatures Kickstarter, past its goal! Here’s the trophy wall of heads on Tumblr. ♃ 09:02—Corbeau’s probably the only one who doesn’t know who Edi from Mass Effect is. ♃ 12:41—the Cog Afterlife is mentioned in the HSD Core Extended text, page 57. ♃ 29:39—Corbeau on Eros, the metal-rich asteroid that really should be a brothel. ♃ 34:40—Whines likes Space Stations. And CJ Cherryh. ♃ 38:40—Looking at character bases. ♃ 39:17—Corbeau’s really excited about TTI’s new living socks. ♃ 39:39—Name-dropping Callahan’s Cross-Time Saloon. ♃ 43:19—Corbeau will eventually turn any RPG conversation to Planescape. ♃ 48:10—play with Traveller’s Solar System Generator yourself! ♃ 54:21—Can the character’s “safe place” be SolNet? ♃ 59:37—Let’s take a moment to appreciate Gypsy.